The new Co-op Composite Distribution Centre in County Durham covers 25,600m2 and supplies products to 262 Costores in the North of England. 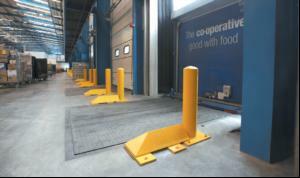 Walkways are separated wherever possible by heavy duty steel balustrades to protect staff, and plant and equipment is protected by the careful siting of bollards, fork lift truck wheel guides, racking protectors and column protectors. Height restrictors are fitted on internal doorways.Vulnerable areas are further protected by double barriers designed to prevent incursion of forks at low levels. Outside in the HGV area, perimeter barriers are supplemented by speed ramps and wheel stops. Berry Systems supplied and installed the safety barriers, including Berry's own spring steel buffers that are designed and tested to absorb impacts from cars, HGVs and fork lift trucks while retaining their integrity and effectiveness. More than 3km of safety barriers and balustrading was installed. Biffa buys buffers for bio plant.